After half cooking the tater tots, cut each tot in half and set aside for now. Also make sure you have cooked and chopped the bacon in advance. In a large skillet, cook mushrooms, onion, red pepper, green onions, spinach and roasted tomatoes over medium heat for 5 minutes. Drain any additional liquid. Stir in the bacon and set aside. In a large bowl, beat the eggs, salt, garlic powder, onion powder, pepper and cream. Lightly spray a muffin tin with non-stick cooking spray. Divide the bacon vegetable mixture amongst the 12 muffin cups. Divide the jack cheese and place on top of the mixture. Pour the eggs over the cups to near the top of the muffin tin. 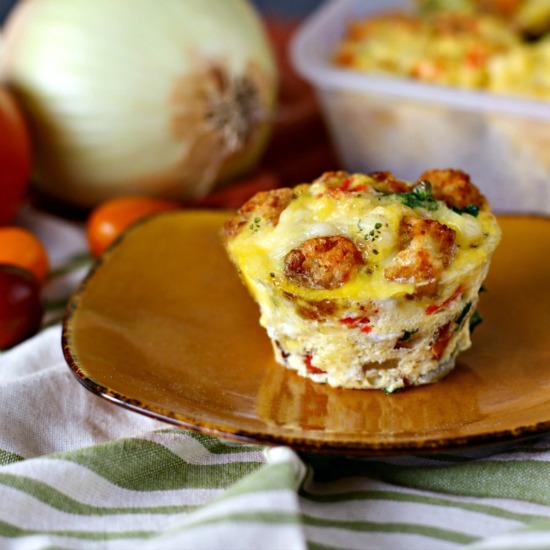 Place 4 half-pieces of the tater tots on top of each muffin cup. Bake for 20-25 minutes or until cooked through. 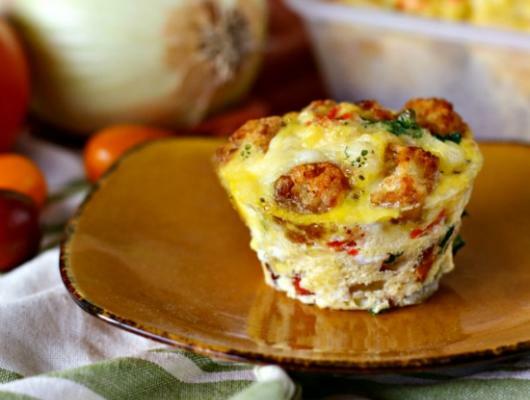 Bacon Tater Egg Cups are packed full of protein and veggies! Make ahead and easily reheat. The perfect way to start your day!